How Schools Are Dealing With Students' Right To Protest : NPR Ed Under federal and state law, teachers and students do not lose their First Amendment rights when they enter school property. But that hasn't stopped some schools from threatening to punish them. 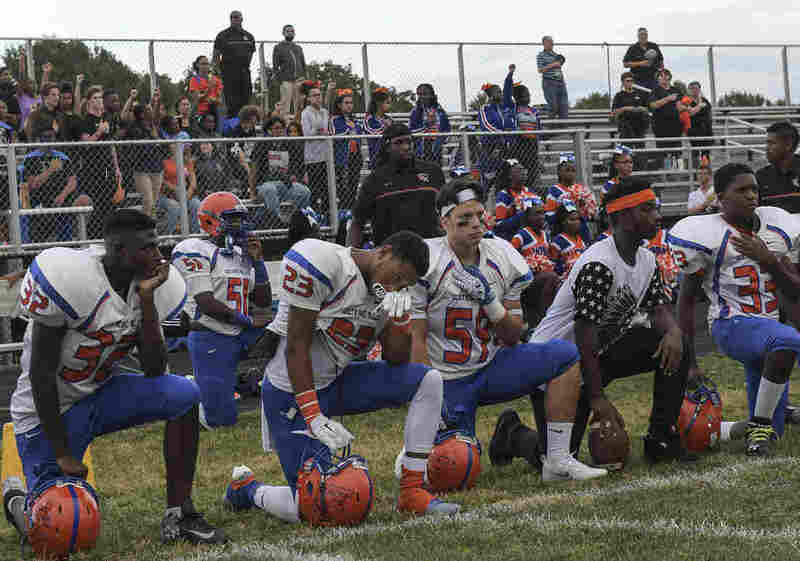 Football players on the Watkins Mill High Wolverines take a knee during the playing of the National Anthem before a game against the Damascus Hornets at Damascus High School in Damascus, Md. After more than 200 NFL players took a knee on Sunday during the national anthem to protest police brutality, public schools across the country have grappled with how to handle students who chose to protest in the same manner. With Saturday night football games ahead for Houston, the district was forced to confront the issue head on. Houston ISD issued a statement that said students will not be forced to stand during the national anthem. "It has been a tradition at HISD athletic events for participants and fans alike to stand in honor of the American flag and the playing of the National Anthem at the beginning of such contests," the statement says. "HISD also protects the constitutional right of student-athletes, as set forth explicitly in HISD Board Policy FNA (LEGAL), not to participate in that tradition." Under federal and state law, teachers and students do not lose their First Amendment rights when they enter school property. Most schools, such as HISD, cite the 1943 Supreme Court case of West Virginia State Board of Education where the court stated that a school would violate the free-speech rights of students who were Jehovah's Witnesses by forcing them to recite the Pledge of Allegiance. "Accordingly, HISD will not mandate nor interfere in the actions of student-athletes in observing or not observing the tradition of standing during the national anthem," according to the statement. But that hasn't stopped other schools and school leaders from taking a different position. One principal from a public school in Louisiana, issued a letter to parents Thursday threatening to remove or suspend students if they took a knee during the Parkway High School football game. "Parkway High School requires student-athletes to stand in a respectful manner throughout the National Anthem during any sporting event in which their team is participating," Principal Waylon Bates wrote. "Failure to comply will result in a loss of playing time and/or participation as directed by the head coach and principal. Continued failure to comply will result in removal from the team." The school did not respond to calls from reporters and the mailbox was full. "It's this chilling effect we find so unfortunate," says Bob Farrace, director of public affairs for the National Association of Secondary School Principals. "Schools are not places of compliance," he says, "they are places of learning." School should teach students to "use their voices constructively and responsively" so that students can become "constructive participants in democracy," says Farrace. Schools first had to deal with this controversy more than a year ago when San Francisco 49ers quarterback Colin Kaepernick took a knee during the national anthem to protest oppressed people of color and to stand against police brutality. "Prohibiting student protest challenges the very purpose of school as a place of learning," says Farrace. East High School in Memphis, Tenn.
Woodrow Wilson High School in Camden, N.J.
Lincoln Southeast High School in Lincoln, Neb. Waggener Traditional High School in Louisville, Ky.
Matthew Fontaine Maury High School in Norfolk, Va.
Auburn High School in Rockford, Ill.
Watkins Mills High School in Gaithersburg, Md. Niskayuna High School in Schenectady, N.Y.
Chandler High School in Chandler, Ariz.
Evanston Township High School in Evanston, Ill.
Taft High School in Woodland Hills, Calif.
Carl Boisrond contributed to this story.